The Conservative Party conference in Manchester was always going to hinge on an important question: what would Boris Johnson do to steal the show? Having demonstrated the hardest of lines on the issue of Brexit, he has become more just a mere thorn in his prime minister’s side. From thorn, he has become a blade, buried in a vulnerable carriage. Theresa May had no doubt hoped that giving him the Foreign Secretary position would see an automatic, sacrificial implosion to celebrate. Johnson had been a noisy Brexiteer and drinking from the poisoned chalice of foreign relations was exactly the sort of thing that would have delighted the May crew. On his travels, his mischief making would remain where he left them. Instead, rumours of a leadership challenge have been humming in Tory corridors. May’s disastrous electoral performance, a miscalculation of gargantuan proportions, has left her, to use the words from the smug former Chancellor of the Exchequer, George Osborne, a “dead woman walking”. The only question on any plotter’s lips is whether Johnson is up to the task. Johnson was never good on matters behind a desk, the sort of mastery of detail that commands a brief and holds his audience by the sheer persuasiveness of labour. Detail is something best left to those who find it important, those squirrel types who parcel data and mind matters as he jaunts and jabbers. The oratorical flourish, the wordy deflection, the self-mocking dismissal: these are the instruments of Johnsoncraft. It is the sheer effortlessness of his statements in terms of their schoolboy sensitivity that delights and outrages. 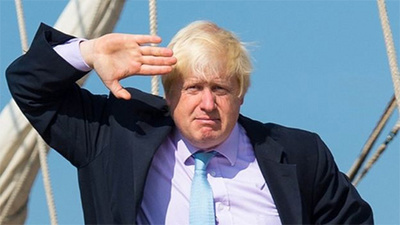 Confusing the global stage, or any stage, as a glorified union debate without strings and codes, Johnson tends to take off the restraints and go for various parts of plain old decency. London was “storming ahead” with frenetic speed; the UK boasted the lowest unemployment rate in 42 years. Dreamily, he gave his audience a vision: Britannia, punching above weight and frame and everything else. “The highest number of people in work ever, the number one destination for investment into Europe”. All, despite Brexit. For all the rich smear and the voluminous sneers, Johnson can barely conceal the sense that the Tories are on the run, that Corbyn might, just might, be dangerous enough to count. The Labour leader seemed to be deluding himself into thinking that he had won the election, expressed in “glutinous victory-style Chavista rallies up and down the country”. But it was May, insisted the foreign secretary, who had won the highest share of the vote in any election in the last 25 years, May who was true victor. (Never mind the electoral belting in terms of lost seats registered at the time.) Best, then, to keep to the deregulation fantasies, the notion that rampant privatisation works. Use of language is a forte of sorts for Johnson, but care about doing so rarely features. Crude, crass and insensitive it may be, but his point is simple enough: after the bodies come the investors, the capitalists and the tourists. The golden road to Samarkand will eventually be taken, if only after a good massacre. May awaits a more opportune moment to hand the sack.